The January 2014 issue of Air and Space Smithsonian Magazine has an article Right this Way to the Space Station that showcases how NanoRacks, through their Space Act Agreement with NASA, is helping to open up commercial access to the International Space Station. The cover photo shows SSEP researchers and future Drs. Dana Betti, Jordyn Catherall, and Kate Yager from Ballston Spa, New York, who participated in SSEP on the final flight of Space Shuttle Endeavour. SSEP is one of the highlights of the article, and in the image gallery you can see ISS Commander Sunita Williams activating a SSEP Mission 2 to ISS experiment. We created the Student Spaceflight Experiments Program (SSEP) around NanoRacks’ access to orbit. 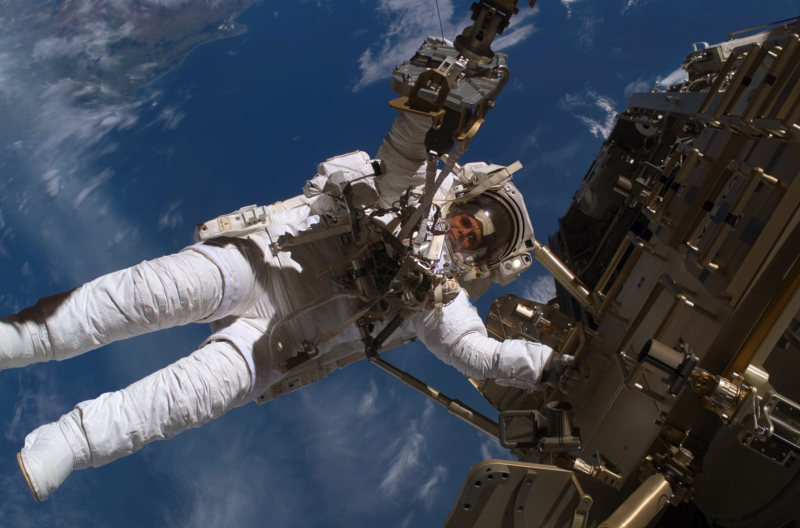 Both NanoRacks, and the Center for the Advancement of Science in Space (CASIS), which oversees the U.S. National Lab on ISS, are strategic and national partners on SSEP. I read the article, and was excited to see the NanoRacks’ story as the means to both showcase this new era of space exploration in partnership with the commercial sector, and SSEP’s role in it. I then sent a congratulatory email to my friend Jeff Manber, who established NanoRacks, and to the entire NanoRacks team. A couple of days later I got an email from Mike Hulslander, Manager of Onsite Learning at the National Air and Space Museum, and who is also an Adjunct Space Science Educator at NCESSE. Mike is the point person at the Museum that makes the SSEP National Conference possible, and was the Museum’s driver behind the live downlink with ISS for over 12,000 across 23 SSEP communities in November 2012. Have you seen the January 2014 issue of Air and Space Magazine? I’m sure you’re aware of the article on NanoRacks, since you were quoted in it. But were you aware that General Dailey was going to mention SSEP in his column on page two? General John R. Dailey is the Director of the Smithsonian National Air and Space Museum and has a monthly column in the magazine. I had not seen it and went to the link right away. General Dailey’s remarks on SSEP speak powerfully to the importance of this program, and to why SSEP was created in the first place. We have reproduced General Dailey’s column below, with his permission, and with the permission of Air and Space Smithsonian Magazine. The Smithsonian National Air and Space Museum in the nation’s capital is a sacred place, and I do not use the word ‘sacred’ lightly. It is dedicated to the countless human generations that dreamt of flying like the birds, and of going to the Moon and to those countless points of light in the night sky. In quest of those dreams, every generation added to the book of knowledge. Every generation put to the test our expanding understanding of aerodynamics, gravity, and propulsion. And every generation patiently and joyfully nurtured the dreams of the next generation. That is also sacred – the role of parents and teachers. In the Museum you will find the Wright Flyer and the X-15, and machines called Mercury, Gemini, Apollo, Viking, Pioneer, and Voyager – each standing in silent testimony to what we as a species have done, and to the remarkable stories of exploration that took us into the air, then to the Moon, and beyond. Why do we have a space program? I believe it cannot be justified alone by spin-off technologies, or the need to demonstrate national prowess. It derives from what it means to be human. We are born curious. We are born to explore. And we go forth because we must go forth. Exploration? It is hard-wired into our genes. And if there is any doubt, ask any parent if they remember that moment in time when the stream of unending questions began. It is what drives the tens of thousands of dedicated individuals that breathe life into NASA, and into America’s Space Program, a national treasure. It is what drove us to create SSEP, so we may inspire and engage our children – our next generation of explorers – in the act of journey, in the act of exploration, so they can see it and experience it for themselves. These things grow from a shared conviction that when we explore we fulfill a commitment to our own humanity. And the act of being true to ourselves comes with other rewards – myriad spin-off technologies, a pathway to space for business and industry, and national pride in what we do on behalf of humanity and in partnership with the nations of Earth – the capacity to send robots to explore other worlds – right now at Moon, Mercury, Venus, Mars, Saturn, and speeding toward Pluto; the ability to study the greater universe and assess our origins and if we are alone; the capacity to establish a permanent human presence in orbit aboard ISS; and to pass forward to future generations a vision that one day humanity will venture into deep space, with their help. We are indeed compelled to climb that mountain because it is there, to push the envelope, and we must nurture that innate need to know in our children. We derive something else from all of this. Pride in our ability to see a frontier, and not only be undeterred, but rather feel compelled by what might be on the other side. And as an individual, a community, a nation, and a race, as we step across that frontier – we feel pride in ourselves. So, next time you travel to Washington, DC, come to the National Air and Space Museum, stand in the Milestones of Flight gallery, and realize that all those that built those machines and flew them … were children once that dared to dream. “Viewport,” by National Air and Space Museum director J.R. Dailey, opens each issue of Air & Space magazine. The column highlights the Museum’s ongoing efforts to preserve the history of aviation and spaceflight. This article appeared in the January 2014 issue of Air & Space. If you want to feel optimistic about the U.S. space program, read the article on page 34 about the work NASA is doing to expand the use of the International Space Station. Getting more private-sector participation in space research has been a difficult balancing act, and after years of work, the public-private partnership is starting to succeed. The space agency and its predecessor, the National Advisory Committee for Aeronautics, were created to do fundamental research, then pass along their results to the aerospace industry. Just as the NACA of the 1930s developed airfoil shapes that any manufacturer could use on its airplane wing, today NASA has created space hardware and techniques that are available to university and corporate researchers. The “plug-and-play” standardization of equipment that has been cleverly advanced by NanoRacks, the company profiled in this issue, was initiated by NASA in 2001 with EXPRESS racks. EXPRESS is one of those infamous NASA acronyms, but what it stands for—Expedite the Processing of Experiments to Space Station—was an early step in making the space station user-friendly. With government funding, there are strings attached. If NASA pays for it, then it has to be good for the world, and everybody gets it. Those conditions can impede the development of space commerce because they impose a lengthy review process and make it tough for a private company to gain a competitive advantage. Today NASA and the signatories of the Space Act agreements are transforming the way government and industry interact. Private companies, such as SpaceX and Orbital Sciences Corporation, developed spacecraft with NASA support but sought private financing as well. They now sell cargo delivery services, with NASA acting as a customer rather than a competitor. The agency found that it was less expensive to help private industry develop its own vehicles and to buy services from those developers than to continue the space shuttle program. Freed from running the delivery service to the station, NASA can focus on exploration programs to take astronauts beyond Earth orbit. It has become clear over the past decade that the agency will not have the budget to do both. There’s more good news in the “expedited processing” for space station experiments: The little boxes that NanoRacks provides are easy for students to use. Through a national competition, the National Center for Earth and Space Science Education has made it possible for students, funded by their communities, to create experiments and fly them in space. This may be the most important development for the future of the U.S. space program. Many young people may be inspired to become future space travelers and scientists because of this experience. We look forward to welcoming the student experimenters next July when they will present their findings at the National Air and Space Museum. Given General Dailey’s remarks, it is appropriate to say to the now nearly 30,000 students that have participated in this program since 2010, to the hundreds of teachers and administrators that have worked tirelessly to provide this experience to their students, to the dozens of communities that have embraced the spirit of the program, to the now close to 400 local partner organizations that make this program possible, to the hundreds of reviewers that have comprised Step 1 and Step 2 Proposal Review Boards assessing over 6,400 flight experiment proposals from student teams – take pride in what we are doing together.